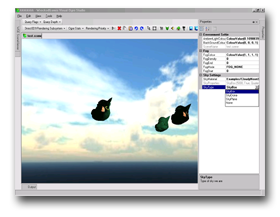 Ogre Studio is a complete DCC tool/editor for use with the OGRE engine. Ogre Studio is a modular, plugin based DCC tool that allows graphical scene editing, text/script editing with syntax highlighting and remote debugging support and many more features. Questions, comments, feature requests, bug reports, etc are always appreciated. You can comment here or in the OGRE Studio Forums. Please report any bugs you find on the Bug Tracker. You can upload patches to the bug tracker as well. Contributors to this page: Beauty , jacmoe and Boost . Page last modified on Wednesday 18 of August, 2010 16:00:28 GMT-0000 by Beauty.